Sputnik: This is not the first mass-terror shooting when we know that there are all too often and repeating themselves tragic(s). What do you see as the main reasons for their occurrences? 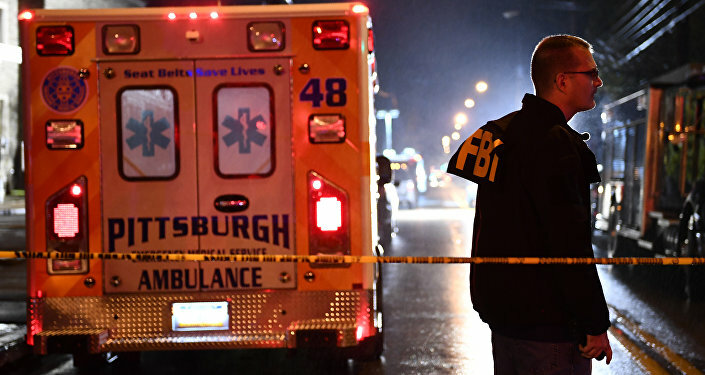 Dan Diker: This is the first time that the United States has experienced a mass murder based on pure anti-Semitism against a Jewish community prayer in a synagogue. Unfortunately, the United States has experienced a number of massacres, school massacres, and other mass killings but this is the first time that a Jewish community at prayer has been massacred of the addition of incitement to the massacre by the murderer Robert Bowers, who has used this technology, social networks, as a hornets' nest for inciting and sharing the incitement of mass murder. Sputnik: What flaws do you believe are there to (their own) this security system and what needs to be done to ensure more public safety now in the United States? Dan Diker: The issue of securing schools and other institutions of higher learning such as universities and colleges, where there have been mass shootings, has become subject of great debate in the United States. And there are those that believe the gun laws have to be toughened, and there are those on the other side that believe that gun laws need to be liberalized for the right people who are good and honest citizens who in line with the American Constitution demand the right to bear arms to protect the good people of the United States. This is also a question that has come out following the Pittsburgh massacre, as to whether armed guards should be posted at religious institutions. I think that from our experience and security experience in Israel we can see that when the right people who are vetted, and who are checked carefully by the government agencies to carry a firearm are able to carry firearms. We have seen in Israel that many, many lives have been saved by many people, the right people, citizens I'm talking about, as well as hired armed guards neutralizing terrorists and others who have come armed to cause people harm just like what happened in Pittsburgh. The public debate in the United States, especially in the aftermath of many, many terrible school massacres by young people who have gotten their hands on submachine guns and have mowed down their classmates, we have seen it across the United States. Those massacres have turned the American debate against the traditional constitutional right to bear arms by the American people and they have really dramatically increased calls for much stricter gun control. I think that the overwhelming media take is that tougher gun control will stop terrorism and these types of hate-driven massacres. The United States will have to overcome a deep, deep psychological wound that comes in line with all of these terrible mass shootings that in the last five-six years the United States has experienced, especially on campuses, and take a look at who should be armed in order to protect fellow citizens from the wrong people holding firearms and acquiring firearms. It means in short that much tougher laws, much tougher vetting laws have to be implemented and what we call multiple layers of security check have to be implemented. That's where the toughening up of the gun laws, it means it should be much tougher to get a gun but at the same time, good people with good records should be allowed to apply and hold firearms in order to protect themselves, their families, and fellow citizens. Sputnik: How long will it be before these tighter regulations are introduced? Have you got any sort of prognosis to it or is it just something we are going to continue to debate? Dan Diker: You know, the United States has well over 325 million peoples in (a) situation where you have hundreds of thousands of firearms legal and illegal flowing across the United States. It's really a question at the end of the day of state regulation and state political will. I can tell you this, the fathers and the mothers of victims of mass shootings if you take a look at many of them, if you take a look at the interviews on mainstream media, whether it is CNN, MSNBC, Fox or any of the other ones, you will see, you will hear them say that they wish there had been an armed guard or teachers that were licensed, other faculty that were vetted and licensed to carry firearms in order and trained in order to protect those students. So, this is a debate on a state level that parents or relatives of victims of these terrible mass atrocities I think will do very well to lead the campaign on a state level. And once you have the momentum whether it's in Florida or whether it is in Ohio or whether it's in California or whether in New York, all four states have suffered terrible atrocities through illegal weapons having been employed by these mass shooters.